Oysters with a buttery, garlicky, spinach and bacon mixture and a crispy panko and parmesan topping. Oysters are something that I always enjoy, though I rarely make them at home since they take a bit of effort but for a special occasion like Valentine’s Day they are definitely worth it! You really cannot go wrong with raw oysters but I like them even more when they are baked with butter and garlic and if you throw in some spinach and bacon things get even better! 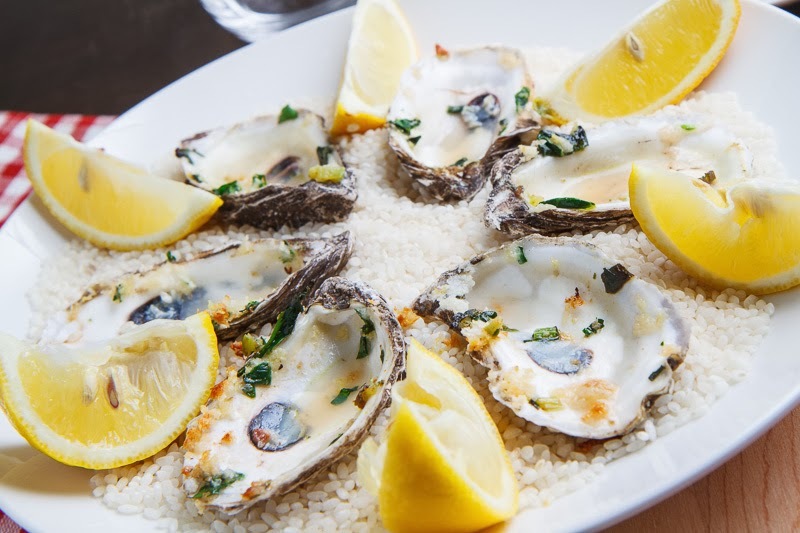 Oysters Rockefeller is an oyster dish where the oysters are topped with a mixture of spinach, butter and garlic along with a crispy bread crumb topping and it is surprisingly easy to make at home. Oysters can be a little challenging to shuck but once you get them open everything else is easy, you pretty much just need to melt the butter, wilt the spinach, place it in the oysters, top with bread crumbs and bake! Of course I like to add a little bacon to the mix, and who doesn’t? 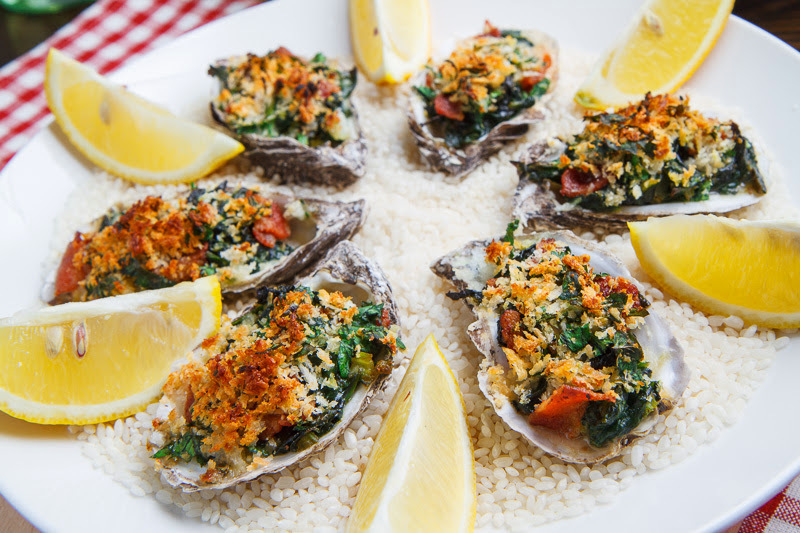 These Oysters Rockefeller are a great way to start off your Valentine’s Day dinner and who knows where it will go from there! Shuck the oysters placing them in a baking pan filled with rock salt to keep them level and prevent the juices from spilling. Melt the butter in a pan over medium heat, add the garlic, saute until fragrant, about a minute and mix half of the garlic butter into the breadcrumbs. Add the spinach, green onion and celery to the pan and cook until the spinach wilts. Add the anise liqueur, deglaze the pan and allow most of the liquid to evaporate and remove from heat before seasoning with cayenne, salt and pepper to taste. Mix the parsley and parmesan into the breadcrumbs. Place a heaping teaspoon of the mixture onto each oyster followed by some bacon and the breadcrumbs. Bake in a preheated 450F/230C oven until golden brown, about 10-15 minutes. Oh my husband would adore these!!! Must make these for him! This is beautiful! We always order oysters rockefeller when we can..its so classic and old school! My husband taught me to shuck oysters..once you're "in", you're good to go! Little Necks on the East Coast are 100% better than oysters and I grew up on the Texas coast. I've never actually eaten oysters. I always get a bit freaked out when they are placed before me for some reason (! ), but these look absolutely delicious! Maybe it's time I gave them another go! food from my childhood: Cooked with plenty of goodies on top like this is a good way to get into oysters! What is considered a serving? That sure is an awful lot of fat. scottiedog1965 6 oysters per serving as an appetizer. I made these a couple nights ago. Delicious! My husband, a true Cape Codder, did the shucking. A friend of ours picked the oysters himself, so they were so fresh! The only thing I left out was cayenne, salt & pepper, because the recipe doesn't say when to add it. Would have been a nice kick to it, so next time I will add it to the spinach mixture. Thanks! To capecodgirl: Re-read step 4…"Add the anise liqueur, deglaze the pan and allow most of the liquid to evaporate and remove from heat before seasoning with cayenne, salt and pepper to taste." OMG yum yum yum! So glad I found you on IG and followed the trail here. You have so many awesome recipes! Please keep doing what you do! God Bless You! ???????? I bought some oysters on sale (not in the shell) today and decided to try this recipe. It did not disappoint! I put them in a muffin tin since they weren't in the shell – delicious! My daughter wants the recipe – that's a big, big compliment! 🙂 Keeper for sure! I made these last night and they turned out AMAZING! I forgot to get parsley but otherwise I stuck to the recipe and they were a big hit with my guests!